I have one green and red storage container that I keep 90% of my Christmas decorations. So, no, we aren't extravagant when it comes to decorating, but there are a few things you will find around our house that help us celebrate the holidays. This is what you need to celebrate the Holidays Williams style. With lots of little hands around, there is no safe place for a fragile Nativity set. I believe my mom found this last year at the local Christian bookstore. She bought one for her home in Indiana, and I bought one for our church. Before it could get to church, though, the kids had fallen in love with it. Every Sunday, we would tote it back home so we could play with it all week. This year, I invested in another one for our home. 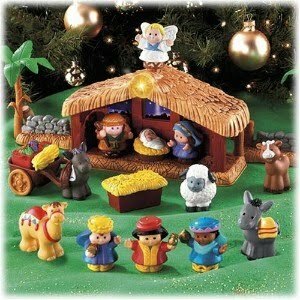 Julian is going around telling everyone he got a manger. "A what?" people will ask. He puts all the pieces in his backpack and carries it from room to room. The other night as he was going to sleep he asked that I lay all the pieces down so that they could sleep too. My mother in law looked diligently for a Jesus' themed advent calendar and found this one which is also great for little hands. My only qualm is that the velcro on the back of the pieces catches the threading of the dates. It's hard to get the kids to stop at just one piece. I've stopped getting upset if the decide to get Jesus out before the 25th. I'm the Children's Ministry director at our church. We use the Godly Play curriculum and I have worked their advent lessons into the advent materials our pastors created for their five daughters. We use this at church, and I reinforce it at home. At some point during the week, we'll sit down and reread the lesson, look at the pictures, and light the advent candles at home. We do the last lesson on Christmas morning before we open presents. 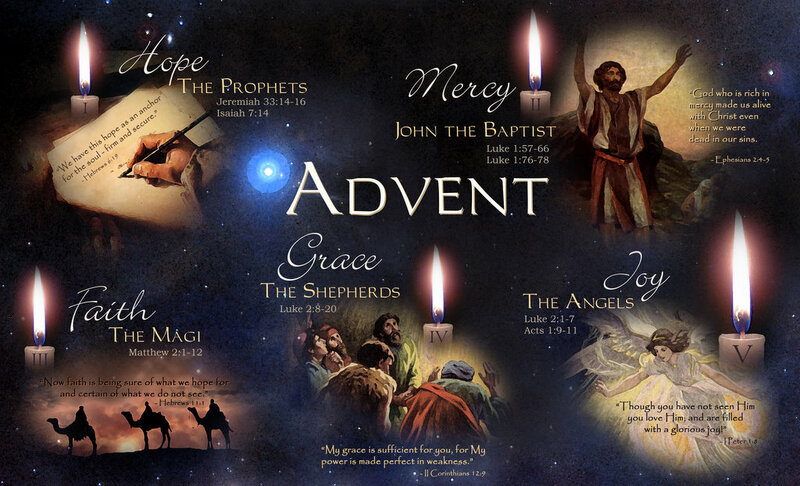 The picture is something my friend, Joy, (our pastor's daughter) created to help her family celebrate Advent. She generously let me use adopt it for my family. I love Christmas music. 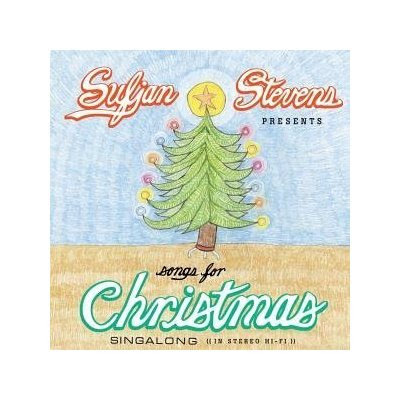 Stephen isn't a huge fan, but this is an album we can both agree on (at least in December...he still can't understand listening to it in August). It's a five CD set that is eclectic, yet traditional. Check it out. When Stephen and I were dating, I kept insisting that we would always have a live Christmas tree in our future home. It was kind of a running joke. 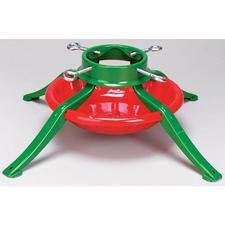 So much so, that Stephen's mom bought me a Christmas Tree stand as a shower gift. The first year we were married, we headed to our local Lowe's store to pick out a tree. We picked a modest $35 one, put the top down on our convertible, and drove it home to our apartment. We had to use our butcher knife to cut the lower branches off in order to get it into the stand. A couple hours and a lot of sap later, we had a live Christmas tree. Keep in mind, that this all happened about a week into finding out I was expecting D'arcy, and by the time Christmas rolled around, I was feeling nauseous. Somehow, the beautiful scent of fresh Christmas trees got associated in my mind with first trimester nausea so for the last five years, we've put up this monster of a fake tree. Well, it's been long enough! We sold our fake one at a garage sale, and next weekend we are off to pick out a modest $35 Christmas tree and put it in our minivan! Under our christmas tree, instead of presents, you'll probably both our Advent Box, our Fisher Price Manger Set, and a basket full of Christmas books and movies. You may have guessed that we like Peanuts since we have a little Peanut of our own (Schroeder). This is definitely my favorite Christmas special, and the kids love it, too. 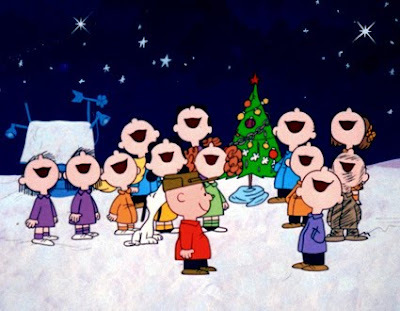 We have the Halloween, Thanksgiving, and Christmas Charlie Brown specials, and last year, D'arcy insisted we needed to locate an Easter one to keep the fun going. I've found a creative outlet in creating a special Christmas card each year. I think three years ago, I sent it via email, but am committed to sending it snail mail from now on (barring any future financial crises). Sending Christmas cards, to me, is such a quaint tradition. When creating a card, I try to strike a balance between giving my friends a taste of what we've been up to all year and sending them a message of blessing. This is the picture we used last year. I hope to post this year's Christmas card in December for all of you to see! 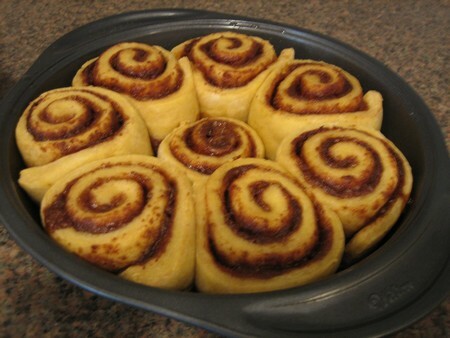 I can't remember a Christmas that my mom hasn't made these for Christmas morning. Yum, Yum. I still can't believe that when I joined Stephen's family, they thought the perfect Christmas food was crackers, Summer Sausage, Bill Bolt's cheese, and coffee. Add a couple of girls who can bake to the mix, and now we have some real treats on Christmas day. We are looking forward to once again being "Home" for Christmas. We've never spent Christmas morning in our actual place of residence. Instead, our tradition is to always be in Indiana with our family during the holidays. We are thankful for jobs that have lots of paid vacation and holiday bonuses that help us make that trek every year. Since Santa Claus isn't really part of our holiday experience, the kids don't get anxious about him leaving their gifts in Texas while they're in Indiana. Instead, they rely on the fact that we'll always be with their Grammy & Poppy and Grandma & Grandpa for the holidays. I love all of these traditions. The coming to Indiana one is of course Grammy's favorite. I am counting the days.